After a 100 years of absence, the first wolf pack has returned to the vibrant city of Rome. This surprising news has spread in Europe and around the world a few weeks ago. The old famous story about Romulus and Remus tells about a female wolf suckling two baby boys who have been abandoned in a basket on the river Tiber. The female wolf saved their lives. Romulus and Remus, later on founded the city of Rome. 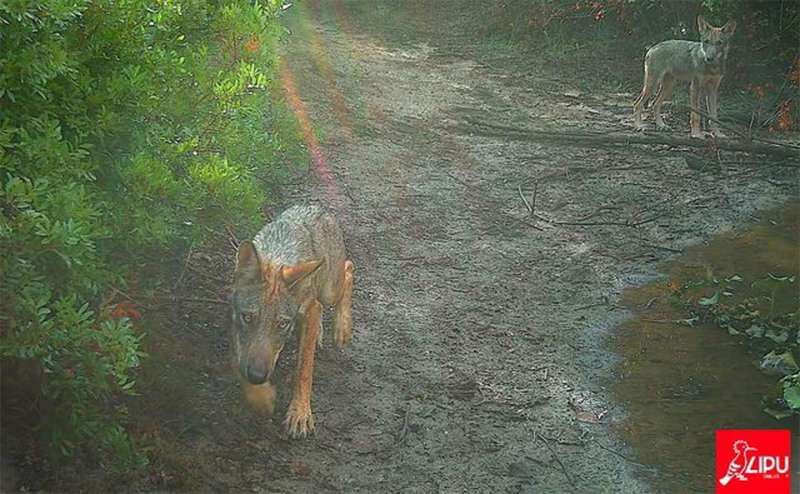 An image taken by a photo-trap, showing two young wolf cubs, started a wave of excitement. Furthermore it provided proof of the presence of the first known Roman wolf offspring in the last 100 years. Oasis Castel di Guido reserve is where they found a home. Finally in 2017 Numa and Aurelia had their own offspring, two cubs. There now is a stable family in this region, a wolf pack. Not surprisingly Rome is welcoming the wolves with an open and positive attitude. Not only in Rome, but also in most of the other Italian regions, wolves settled again. They are living and feeling quite comfortable in the plain. “In a few decades, the species’ status shifted from almost extinct to at least one wolf pack in every Italian region, excluding Sicily and Sardinia.”, says Mauro Belardi of EWS Italy and Eliante. The local scientists led by Alessia De Lorenzis from LIPU and Marco Antonelli, the responsible researcher for the local wolf monitoring in the same reserve, are doing research on the wolf in this area. Since the first evidence of wolf presence in 2013, they collected data and did a monitoring of the wolves. Alessia De Lorenzis has been reporting about the return of the wolves to Rome, in an interview, which was conducted by Mauro Belardi. Belardi wrote an article about the wolf’s return to Rome. In the following video interview, conducted by Gaia Angelini, Alessia De Lorenzis and Antonelli are talking about their first-hand impressions of the wolves’ return. They speak about challenges, hopes and benefits of the wolf’s presence. They are also starting a call for collaboration between Rome’s citizens, farmers, hunters in order to be well prepared and informed for this new coexistence. On 10 December in Oasis Castel di Guido of LIPU (BirdLife Italy), there is an informative event all around the topic wolves. The invitation goes to all interested people, farmers, hunters and representatives of tourism and their partners. Understanding potential fears of challenges, De Lorenzis and Antonelli want to talk to people and provide information. They want to teach people how to avoid potential risk and damage. Furthermore the event is supposed to inform about the studies of wolves done in the recent years in Oasis Castel di Guido. Gaia Angelini, an active environmentalist and advisor of the European Wilderness Society, conducted the following video-interview. She was talking to Alessia De Lorenzis, the responsible of Oasis Castel di Guido of LIPU and Marco Antonelli, who is also responsible for the local wolf monitoring of this new wolf pack. Scientific research showed that wild boar is the main diet of the wolves in this area. This offers a new chance for a potential control of the high wild boar populations. Wild boars is already causing many conflicts in different European countries. More and more they are spreading into urban areas, even being present in big cities like Berlin, Germany. As well, there have been some alarming incidences between people and wild boars. Close encounters with this species sometimes lead to aggressive response. Wolf, as a natural antagonist of wild boar, can take the important role as a balancing element for ecosystems, by decimating them. A very promising fact, that could balance the wild boar situation around Rome in the future. The positive, balancing effect of wolves on the environments are manifold and become more and more obvious. In which positive way wolves influence the health of forests, was seen in Graubünden, Switzerland. Also regarding our high populations of ungulates, we could benefit from this predator. Wolves might be able to support us in controlling our man-made over-populations of ungulates. The Calanda wolf pack of Switzerland is a perfect example that shows this supportive effect and regulation of ungulates in an impressive way. Especially relevant is the key-role the wolf fulfils as a predator in ecosystems. “As I said, it is a matter of ecosystem balance, but let us not forget the great value that the wolf has for Rome, because wolves are the symbol of the capital Rome. And therefore also an attraction in terms of tourism and for nature tourism.”, says Alessia De Lorenzis. This new trend of wolves living in close distance to big cities corrects this old belief of wolves needing huge ranges of remote, wild habitat. As a very adaptable species, they can exist in semi-urban and urbanized environments, even close to busy city life. We now have the proof, that wolves live in almost every region of Italy, one of Europe’s most populated countries. Due to this close proximity of wolves in urbanised areas and to people, we can expect encounters to happen sooner or later. How to react in case of encounters, clear information and a good communication is needed. “A new communication strategy is urgent, because communication is more and more becoming the most important tool in wolf conservation. It’s very obvious that this species is very flexible regarding preference of habitat, prey and connectivity, despite of the high urbanisation of the country. “The only problem for the wolf is people’s behaviour. People’s attitude towards wolves is the big challenge.”, says Mauro Belardi of EWS Italy and Eliante. The researchers De Lorenzis and Antonelli already put a lot of effort in monitoring the wolves of Oasis Castel di Guido. Greater involvement and support of the authorities would enable them to focus on the monitoring more deeply. Radio collar technique on a wolf would allow them to gain insights into a wolf’s movement and maybe analyze movement patterns.